Jay Sexton puts American history in a global perspective. Emeritus fellow at Oxford and professor of history at the University of Missouri, Sexton describes a nation prone to abrupt reversals in its relations with the wider world. The United States has gyrated between free trade and economic nationalism, between encouraging immigration and restricting it, and from expansionist foreign policies to those aimed at limiting its commitments abroad. The same geopolitical shifts that enhanced American security and power often devolved into periods of instability at home. These traits apply to the United States in the 21st century, but they emerge from a pattern that has appeared and reappeared since the 18th century. Early sparks of crisis often turned into flames that roared out of control. The post-1763 political divisions turned into a full-on civil war with the home country in 1775. Abraham Lincoln’s election triggered Southern secession and another civil war, the deadliest war in U.S. history. The banking and unemployment crises of winter 1932–1933 brought the U.S. economy to its knees just as the Franklin D. Roosevelt administration began. Exigency required rapid mobilization, and new political forms swept away the old as a New Deal took shape. Sexton says that these bursts of creative destruction gave birth to political institutions that are still with us today. Still, despite recent events—the shock of 9/11, the 2007–2008 financial collapse, the 2016 election—the crises of the 21st century have been contained. In Sexton’s opinion, recent tremors have not yet erupted into one of those major quakes that forever transform the American landscape. Ours has remained an era of gridlock, not transformation; of pendulum swings, not definitive turns; politics of personal destruction, not the creative destruction of political institutions. So far the poor have cushioned the blows for the rich. Infrastructure and alliances are crumbling. The peoples of the Middle East have born the brunt of America’s national security policy. Stormier waters may well lie ahead. The more we look outward, and act on the premise of global interdependence, the more prepared we will be. 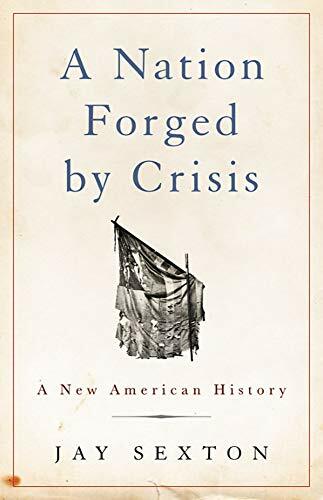 A Nation Forged in Crisis illustrates its recounting of U.S. history with many rich details, for example, the reasons why British financiers were willing to make huge loans to the Union in the 1860s but feared to subsidize the South. However, the theory behind the book’s thesis is amorphous and poorly defined. Sexton could do more to note parallels and differences in his own analysis with those of other scholars. Having studied 21 civilizations, the English historian Arnold J. Toynbee concluded that each civilization arose as a creative response to a profound challenge and that most perished when they failed efficiently to meet new threats. The Austrian-American economist Joseph Schumpeter argued that industries and entire economies prosper due to patterns of creative destruction. How does Sexton’s big picture agree with or depart from the theory of punctuated equilibrium—developed by Niles Eldredge and Stephen Jay Gould—that living systems exist in an extended period of stasis, which are later punctuated by sudden shifts in radical change? Sexton questions whether America is an exceptional nation. “What most stands out when one takes the global view of its history is just the opposite—the United States has reconfigured, even reinvented, itself during moments of crisis.” A critic might respond that this ability to reinvent a nation is part of what makes an exceptional nation.